Six months ago I wrote about Facebook reaching 1.1 billion users in 2012. Since then Facebook has reached another milestone. In the IPO prospect amendment they announced that there are now 901 million monthly active users. But let’s see what has happened in the big countries where Facebook is still growing and may not yet have a dominant position. Half a year ago in India Facebook had 37.37 million active users. Now we can say for certain that India has been won by Facebook. 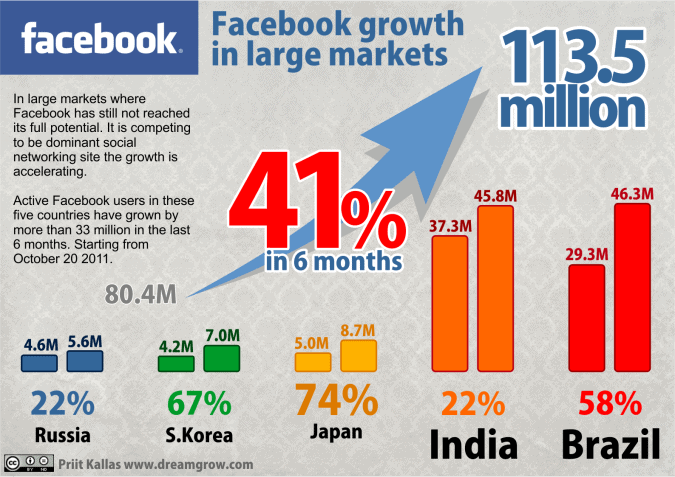 Right now there are 45.82 million Facebook users and the penetration of online population is more that half (56.57%). I predict that Facebook penetration will reach to about two thirds of India’s online population bringing the total number of users close to 60 million. The kingdom of Orkut is no more. Half a year ago I predicted that Facebook will overtake Orkut in Brazil in early 2012. But it happened even earlier and Facebook’s growth in Brazil has been unbelievable in the last 6 months. It started from 29.3 million users in October 2011 and now it’s 46.34 million. 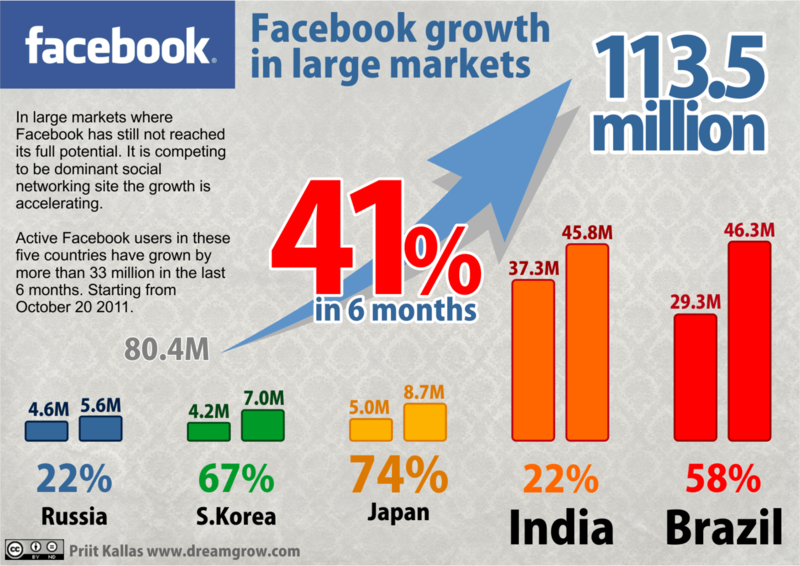 The rate of growth has been 58.16% which means Facebook has gained 1 user per second for that period of time in Brazil. With this insane growt Brazil passed India by almost 1 million users. Penetration of online population has reached 61.90%. In Russia is Facebook is lagging. However in the last 6 months it has added more than 1 million users reaching 5.63 million. The growth has been modest (22.39%) compared to other countries in this review, but it’s steady. This slow adoption rate is caused by Vkontakte.ru and odnoklassniki.ru that are the major competing social networking sites in Russia. I think that the adoption rate of Facebook is speeding up and by the end of 2012 we can see 7-9 Facebook million users in Russia. Read more about Social Media in Russia. Japan exploded! Facebook grew 74% in the past six months. From 5 million to 8.7 million users. As I mentioned in my earlier post the rate of growth is accelerating. This means that by the end of the year Japan may reach 13-16 million users. Similarly to Japan, South Korea has seen a huge growth in the adoption of Facebook with 67.38% increase in monthly active users. It has reached 7.03 million users. Now the penetration rate in online population is 17.81%. This penetration rate suggest that the tipping point has been reached and the Facebook user-base may well double by the end of 2012. Banned! Not available! China is blocking Facebook. Facebook will do all it can to get that ban removed. Until then there’s nothing to report. Some sources say that Facebook is looking for a partner that operates in China to get in. Also Facebook’s recent acquisition of Instagram may open some new avenues. However, if social, economical and political pressure open China for Facebook then network effect will do its magic for Facebook. Network effect is a powerful force that works in favor of Facebook. People are not interested in using a lot of different general purpose social networking sites. This means that over the time the dominant player will get its competitors users to switch. If nothing will get in the way, Facebook will top 1.5 billion users.